Regarless of what type of contact lenses you choose to use, it is important to learn to properly care for them. Eye Doctors report that 50% of their patients are “non-compliant” when it comes to cleaning and care of their lenses. Improving how you care for your lenses can increase your comfort level as well as the lifetime of your contacts. 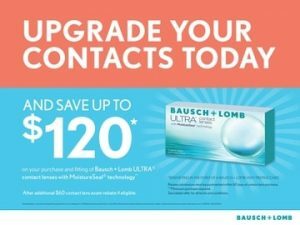 It's important to properly care for your contact lenses. Here are some "dos and don'ts" to keep in mind. Here are some helpful tips to keep your gas permeable contact lenses at their best. Print and bring this handy information sheet to your eye doctor appointment and use it to keep track of the wearing schedule and care plan for your contact lenses. (Courtesy of the CLSA University).